Latte Bread will fill your home with the most beautiful aroma. It's moist and dense with a subtle espresso flavor that latte lovers can't get enough of! 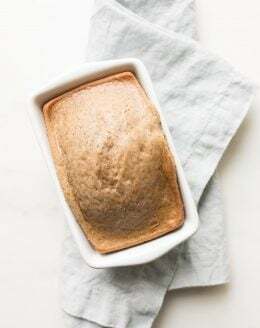 This no-yeast bread (which can also be called Espresso Bread) is made with just a few staple ingredients and espresso powder, in just a few minutes! Grease 6 mini loaf pans and preheat oven to 350 degrees. Combine sugar, flour, baking powder, salt and espresso powder. Beat eggs, milk and oil. Gradually add dry mixture to wet until just moist. Pour batter into pans an inch below to compensate for rise. Optional: sprinkle sugar on top. You can adjust the amount of espresso powder to your preference.